The freedom to say ‘no’? 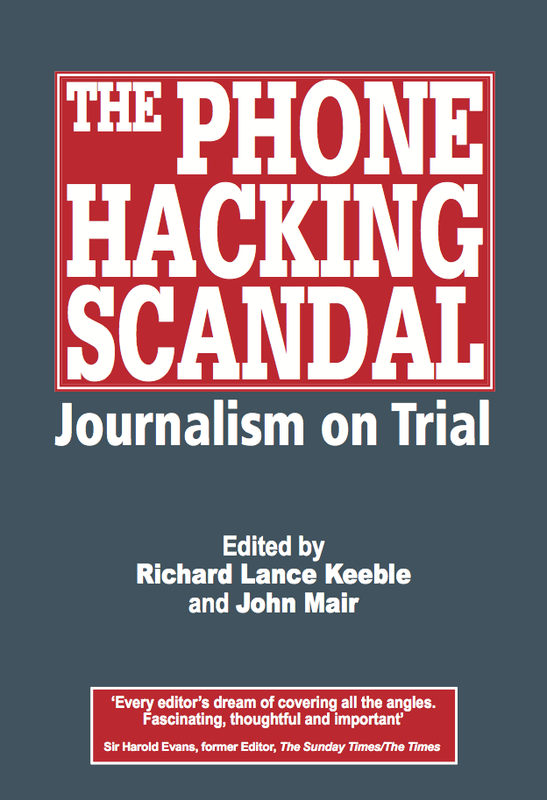 The Phone Hacking Scandal: Journalism on Trial, edited by John Mair and Richard Keeble, second edition published September 2012 by Abramis. As journalists and other citizens in the UK await the recommendations of the Leveson inquiry, journalism lecturer Tony Harcup argues that a crucial freedom for journalists is the freedom to say ‘No’ to an unethical instruction. 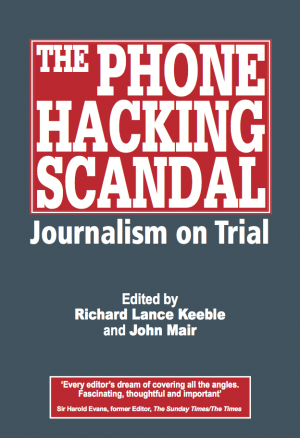 In this edited extract of a chapter in the book The Phone Hacking Scandal*, he explains why. Rupert Murdoch will possibly have forgotten it already but there was an interesting exchange towards the end of his testimony to the Leveson Inquiry in April 2012. Lawyer John Hendy, on behalf of the National Union of Journalists (NUJ), asked Murdoch Sr about evidence the inquiry had previously heard of a bullying culture at the News of the World. When Murdoch responded by asking why the complainant had not resigned if she had not liked working for his newspaper, Leveson himself intervened to point out: ‘I think the problem with that might be that she needs a job.’ Well, quite. Mr Hendy: Are you aware that the NUJ has for a long time been seeking the insertion in contracts of employment, not just at News International but other titles, of a conscience clause, that’s to say a provision by which it is forbidden to discipline a journalist who refuses to do something which is unethical or against the code of practice? Mr Murdoch: I have never heard of it. Lord Justice Leveson: Do you think it’s a good idea? Lord Justice Leveson: No, but the clause. Mr Murdoch: For us to say as a condition of employment in a contract for a journalist they have the right to do that, I think that’s a good idea. These questions seemed to come as something of a surprise to Rupert Murdoch, and maybe he had not been fully briefed on UK newspaper proprietors’ traditional hostility to any idea of a conscience clause. But there is just the possibility that his replies indicate something of a growing acknowledgement, even within the industry’s senior ranks, that their foot-soldiers ought not to be left to take all the blame for unethical journalism. As John Hendy pointed out, the NUJ’s call for a ‘conscience clause’ is not new. It dates back at least as far as 1931, the very year in which Conservative Prime Minister Stanley Baldwin was famously accusing newspaper owners of seeking ‘power without responsibility’ which was, he added with a flourish supplied by his cousin Rudyard Kipling, ‘the prerogative of the harlot throughout the ages’. It was in 1931 that the NUJ felt the need to appeal to proprietors and editors alike to refrain from instructing their journalists to use ‘distasteful and unseemly’ methods of covering stories or getting pictures. The union went on to promise to ‘treat the case of a member who was dismissed for refusing to carry out instructions repugnant to his sense of decency, as one of victimization, ie to maintain him while getting fresh employment’. The issue did not go away. In 2005 the NUJ agreed to add the following wording to its code of conduct, which forms part of the union’s rulebook: ‘The NUJ believes a journalist has the right to refuse an assignment or be identified as the author of editorial that would break the letter or spirit of the code. The NUJ will fully support any journalist disciplined for asserting her/his right to act according to the code’. The addition of the clause to the union’s own code amounted to an assertion of a right and a promise of backing, but without a similar clause being included in the codes of media employers or regulators it has had little effect in practice. And there the matter lay until the summer of 2011 when the Guardian’s revelations about Milly Dowler’s phone having been hacked by a private investigator working for the News of the World became the tipping point in the so-called ‘Hackgate’ scandal, resulting in the Leveson inquiry. Questions of journalistic ethics were back on the political agenda and the thought began to occur: would all this have happened if journalists on the offending newspaper had been empowered to speak out about dodgy practices? Indeed, could it possibly have been more than coincidence that the scandal had occurred in a workplace from which independent trade unions had in effect been banished? It might be that Lord Justice Leveson is more open to such an argument than have been most newspaper proprietors to date, judging by the fact that in reversing his earlier decision to refuse the NUJ ‘core participant’ status at his inquiry, he seemed to acknowledge that the union represented views from the newsroom floor that might be different from the views of those traditionally allowed to speak on behalf of what is typically termed the industry. ‘I see considerable force in the submission that, through its members, the NUJ does provide a different window on the issues with which the inquiry is concerned and, just as important, is able to access evidence on the issues of culture, practice and ethics which the inquiry might not otherwise be able to obtain,’ he said in his ruling. It is not that a conscience clause in the UK would be a magic solution to what are perceived as journalism’s ethical shortcomings; it is not that all citizens nor indeed all journalists would necessarily agree on what those shortcomings might be; and it is not that such a clause would eliminate the grey areas of interpretation that are often where the real choices are made. Such a clause would be very unlikely to be at the forefront of most journalists’ thinking most of the time, and the chances are that it would be used very, very rarely if ever. But its mere existence could help contribute to a healthier workplace culture within newsrooms in which questions can sometimes be asked and objections can occasionally be voiced without those at the bottom fearing a verbal onslaught at best or being shown the door at worst. After all, isn’t the essence of journalism supposed to be about asking questions? Asking questions about journalistic practice can only be a positive thing for ethics, even when it is an uncomfortable process, and journalists ought to be allowed to ask such questions occasionally, just as those of us involved in journalism education ought to welcome students who question conventional wisdom. A conscience clause as proposed by the NUJ, offering journalists some form of contractual protection, might be one small step in the direction of making such questioning more possible for more journalists than it has been in recent years. 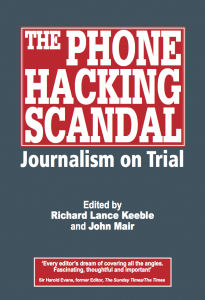 * The Phone Hacking Scandal: Journalism on Trial, edited by John Mair and Richard Keeble, second edition published September 2012 by Abramis. Tony Harcup is a senior lecturer at the Department of Journalism Studies, University of Sheffield. He is the author of The Ethical Journalist (Sage 2007), Journalism: Principles and Practice (Sage 2009), and Newspaper Journalism (Sage 2010, with Peter Cole). His next book, Alternative Journalism, Alternative Voices (Routledge) is due for publication early in 2013.